This is a longer version of an article that should be in The Hastings Independent soon. 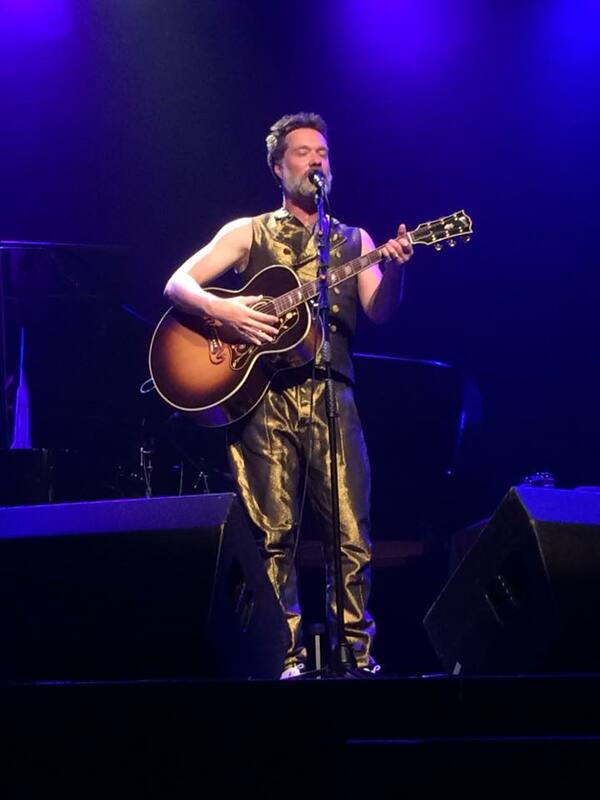 My wife introduced me to Rufus Wainwright’s music about 10 years ago. It was the start of an obsession that’s still going strong, so I was over the moon to hear he was coming to The De La Warr. The first song of Rufus’ I heard was ‘Nobody’s Off The Hook’. It was love at first listen. It’s a friendship-love song with an impossibly pretty melody and string quartet arrangement. He didn’t play it at The De La Warr: I’ve seen him four times and he doesn’t ever play quite the right songs. It’s almost as if he doesn’t plan his gigs just for me! Let’s put this selfish complaint aside: it was a fabulous night. He played on his own with piano and guitar. I’ve never seen him play a whole gig like this before and it was lovely, intimate and natural. He started by telling us about his swim in the Bexhill sea, having fish and chips and dozing off. He was warm and funny throughout. His voice has got better and better over the years. No one sings like Rufus. He’s got a breathless superhuman soaring voice but he does not make it look effortless like opera singers often do. It’s a bit uncomfortable to watch on some of the high ones- like he’s going to burst a vein. Third song in and I was hopeful it might be my fantasy-Rufus-gig after all as he did ‘Memphis Skyline’. I’ve never heard him play it live before. It’s a long, slow, decadent, hypnagogic dream-song about his friend Jeff Buckley. It’s got 3 or 4 musical sections with no chorus. It’s not going to make the radio 1 breakfast show any time soon! It takes you to some distant moonlit place where Rufus finds flickering cinematic memories of his lost friend. It’s full of sad longing and sounds as deep as the ocean. The recorded version has lots of layers and is very produced. It’s incredible how he gets all the drama of songs like ‘Memphis Skyline’ across just with voice and piano. I love the ambitious orchestration on his studio recordings but the performance left me feeling he could have saved a lot of money and recorded a lot of songs just with piano. I think I’m only the millionth person to say this. He’s not so good on guitar and he plays it in a weird way where he strums really hard with his fingers rather than with a pick. It looks really painful. I do worry about the state of his finger tips. I feel like he’s developed all the elements of his music in idiosyncratic ways separate from everyone else. He’s really not shy but I reckon he creates everything from hours and hours of introverted working alone. Of course he plays guitar in an odd way. Slightly disappointingly, after ‘Memphis Skyline’ he went on to do a pretty familiar set list – including Art Teacher, Gay Messiah, Going To A Town, Cigarettes and Chocolate Milk. All fabulous but I would have liked a few more surprises! Saying that, the filthy anti-Trump rap was a perfectly timed surprise in the middle of the set. He played some new songs from his next pop album, due next year. It all sounds very good. There was an intense song about a hangover, a beautiful love song for his husband Jorn, and a vocally stunning slow song about needing ‘Alone Time’. I think my favourite new one was a quietly anthemic song celebrating ‘Only The People Who Love’. It was a warm and lovely evening from a completely unique writer and performer. I’m sure he’ll come back, after all he said how much he liked ‘darling little’ Bexhill about 3 times. If he does, I’m writing the set list!